Your matcha fix never tasted so good. 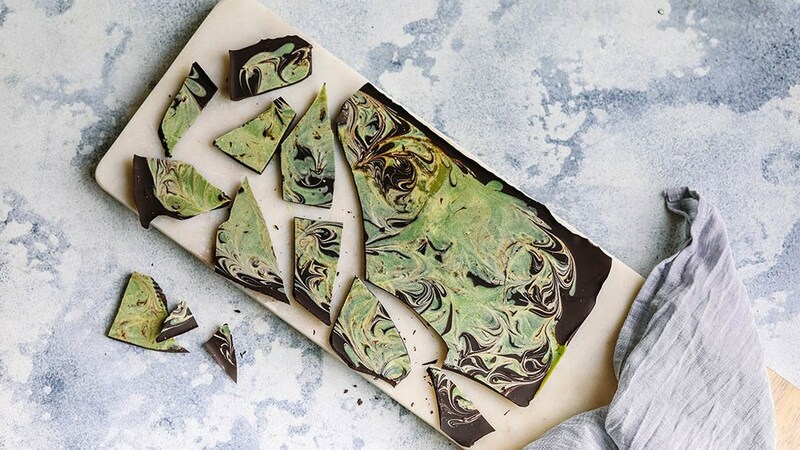 This Matcha Swirl Chocolate is easy (think melt, pour and swirl), super delicious and so pretty. Line a slice tin with baking paper and set aside. Break the dark chocolate into small pieces and transfer to a microwave safe bowl or jug. Using 30 second bursts, melt the dark chocolate in the microwave, stirring after each burst (it takes 1 minute and 30 seconds in my microwave). Pour the melted dark chocolate into the lined slice tin. Next, melt the coconut butter in a small saucepan over a low to medium heat until it is completely liquid. Add the rice malt syrup, matcha and vanilla and stir until well combined. Remove from heat. Dot 6 teaspoons of the matcha mixture over the top of the dark chocolate and then use a toothpick or skewer to make circular swirls through the chocolate. Transfer the slice tin to the fridge and leave the chocolate to set for at least an hour. Once set, break into pieces and enjoy.